I first heard Bryan sing in church. I was so moved by his voice and his performance that I felt compelled to approach him about recording an album. He said he’d never really recorded before, and I had never worked with an artist with a voice like his before, but we both agreed that it would be fun to try to do something together. With the generous assistance and talents of Jonathon Willis...this is the result. Bryan has given a very sensitive interpretation of some unusual songs of great power and romantic strength. I found it interesting that this is one of the few CD's that is multigenerational. In a special occasion, my daughter, granddaughter and I enjoyed the solitude filled with the uplifting sound. I received my CD in the mail yesterday, and am enjoying it as I toil away at work today!! The songs are wonderful, the lyrics beautiful, and your voice and phrasing perfect. I am looking forward to listening at home on a real stereo, at higher volume so I can get the full effect. It is perfect music to listen to in these days of anxiety - uplifting, comforting, and hopeful. This is so great!!!! Congratulations to you for creating such a work of art. A timeless journey into the wellsprings of the heart. In today's world it is considered trite to believe in the concept of "one true love", but these poignant lyrics and beautiful melodies make it possible to do just that. It is difficult to capture such depth of emotion in a collection of songs, but songsmith Jim Weatherly is no stranger to this venue, having written such classics as "Midnight Train To Georgia" and "You're the Best Thing That Ever Happened to Me". 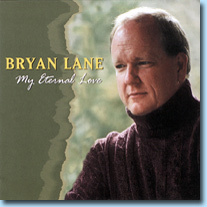 Bryan Lane interprets Weatherly's words with heartfelt sincerity. His vocal stylings here remind me of Andrea Bocelli, and the orchestrations of Jonathon Willis nicely complement Lane's tenor without becoming overwhelming. The best tune by far is the title track "My Eternal Love", but "My Heart Will Always Remember" is a close second. In "Sails On The Horizon", the story of a woman whose love has gone to sea touches something primal and instinctive. All in all, "My Eternal Love" is a worthy first effort from this exciting new artist. No one who has ever truly been in love can be unaffected by this record.